In Sweden anything with saffron is considered Christnassy and festive, and that’s the reasoning for making this chewy saffron and white chocolate cake for the book club Christmas dinner. It’s very yummy without being too sweet and although quite pretty it would have been even prettier with the intended icing. I was convinced I had icing sugar at home but there was none in the cupboard, so I served it plain and that worked well too. I had creme fraiche on the side (that was intended for the frosting) but lightly whipped cream works well too. Translated from and adapted after Ica’s recipe. Preheat the oven to 175°C. Butter and flour a 24 diameter springform. Melt chocolate and butter in a Bain Marie or in the microwave. Add the saffron and leave to cool/dissolve a for a few minutes. Mix the dry ingredients in a bowla and add to the melted chocolate. Add egg and vanilla and mix until smooth. Pour the batter into the springform and place in the middle of the oven. Bake for 23-25 minutes. Leave to cool. Beat crème fraiche, icing sugar and vanilla until smooth and quite set and spread ut onto the cake. Add pomegranate seeds. The last couple of years I’ve had a standing brunch around Christmas time for some of my Swedish friends and their families. As their brood is getting bigger brunch seemed like the ideal concept; there is something for everyone and you don’t have to sit down to eat at the same time. Sadly, this brunch in December will probably have to be the last one as there’s now too many of us and apart from cooking for a large amount of people there is quite a lot of furniture carrying required to make it happen. But we’ll see, maybe I can work out a way to make it easier… Any ideas welcome! The concept has been more or less the same every year; people arrive at midday, and I provide both savoury (always eggs, bacon, different types of bread with toppings such as cheeses, jams, paté, ham etc. – we love our open-faced sandwiches in Sweden as you know) and sweet (usually two types of cake) dishes, and we eat and chat and eat and chat and play with the children. This year I substituted the usual brunch eggs with my take on shakshuka (recipe to follow) and mum made an large omelette with creamed mushrooms on top as well. Although people always love the savoury element I seem to have gathered a group of friends with very sweet teeth so I always try my best to come up with something super yummy on the sweet side. This year I was quite pleased with my efforts of serving madeleines (best recipe ever!) straight from the oven and just lightly dusted with icing sugar. And although people liked them, this chocolate cake was the star of the show: chocolate cake with pieces of white chocolate dispersed like little surprises, covered with a white chocolate truffle and colourful smarties (although you can of course decorate it however you like). The texture is quite dense and chewy (in a good way – just don’t expect a fluffy cake) and rather filling, so one cake could probably feed 10-12 people, but as my friends love sweets I thought it safer to count 8-10 people per cake. It’s (sadly) not my own concoction at all, but I know I can always trust fabulous Annika and her reliable recipes. Translated from and adapted after Annika’s recipe. The cake itself (without the truffle) freezes well and can be made ahead of time. Defrost slowly and add the truffle and decorations a few hours before serving so it has time to set. Pre-heat the oven to 175 C. Line the bottom of a springform with parchment paper. Grease the paper and the edges of the tin. Beat eggs, sugar, vanilla and salt until pale and fluffy. Stir in the melted butter. Sieve cocoa and flour and fold into the batter. Pour the butter into the tin and press down the chocolate pieces. Bake in a low oven for 35 minutes. Leave to cool and cover the tin and let it set overnight. Heat up the cream in a saucepan. Break the chocolate into pieces and add to the warm cream. Mix slowly until smooth. Leave to set, then spread it onto the cake. Keep in the fridge until just before serving. Decorate with smarties or other sweets, sprinkles, chopped nuts etc. Serve with lightly whipped cream. December is pretty stressful for all of us, so when I can simplify things I try to do just that. I write my Christmas cards in advance, do most my Christmas gift shopping online etc. The same applied when I after a party weekend away for my dear colleague wanted to bake some cakes for her actual birthday in the office. In my head I wanted to do this lovely chocolate Pavlova, but when I came home tired after a great party and having had to deal with snow (!) in London, I lowered the bar somewhat. And I’m so glad I did. Sometimes less really is more and all my colleagues loved this cake. I topped it with Maltesters but throw on whatever chocolate, fruit or berries you like. Beat the egg whites until foamy. Add the sugar a little at the time while beating. Once added beat until stiff peaks form and you have a glossy firm meringue (you should be able to hold the bowl upside down wihout the meringue moving). Line a baking tray with parchment paper. Using a spatula, pour the meringue out onto the parchment paper and shape it into an even circle. Bake for 60 minutes. Then turn off the oven and leave the oven door ajar until the oven has cooled down. Leave to cool completely. Turn the cake upside down onto a cake plate and remove the parchment paper. Lightly whip the cream and spread on top of the meringue. Top with Maltesers and dust with cocoa. Serve immediately. Some people, like my wonderful mother, love apple pies and cakes. I actually think she could live on it alone. I, on the other hand, am a little harder to please. Raw apples – delicious. Mushy cooked ones – not so much. I want set cakes, that provide a nice contrast to the soft apples. This cake has the Hanna seal of approval; it’s cake-y, has a nice crunchy top but is still apple-y enough for the likes of my mother. Happy days! Place the apple slices in a lined springform. Scatter with sugar and cinnamon. Beat eggs and sugar until pale and fluffy and mix in the flour. Pour into the tin. Bake for 60 minutes in 175C. Serve with lightly whipped cream. These seriously-easy-to-make vanilla squares are so nice even the boys in the office asked me for the recipe. They remind me of a pastry we have in Sweden called vaniljhjärtan (vanilla hearts); a thin pastry heart filled with wonderful vanilla cream. These square are a little sharper than those, because of the fromage frais and creme fraiche, but that’s not a bad thing. I just think it adds freshness and make the squares seem lighter. Deceptive, I know. This recipe makes a lot of cake, but you can easily halve it or just make the whole batch and put some in the freezer. Translated from and adapted after the recipe in Hemmets Journals. Mix butter, flour, sugar, vanilla and baking powder until a sandy texture, using a food processor. I had to make it in two batches as my food processor isn’t very big. Press half of the crumbe onto a parchment paper in a large baking tray (I used two smaller ones). Mix egg, fromage frais, creme fraiche, sugar and vanilla in a bowl. Pour the filling over the crumb base. Pour the rest of the crumble mixture on top. Bake for 30 minutes in the middle of the oven. Leave to cool and cut into squares. This cake dates back to the 13th century in Siena, Italy and because the cake has been around for so long there are lots of different recipes around. I settled for Jamie Oliver’s as I thought it sounded nice with figs in it, and it was really nice. 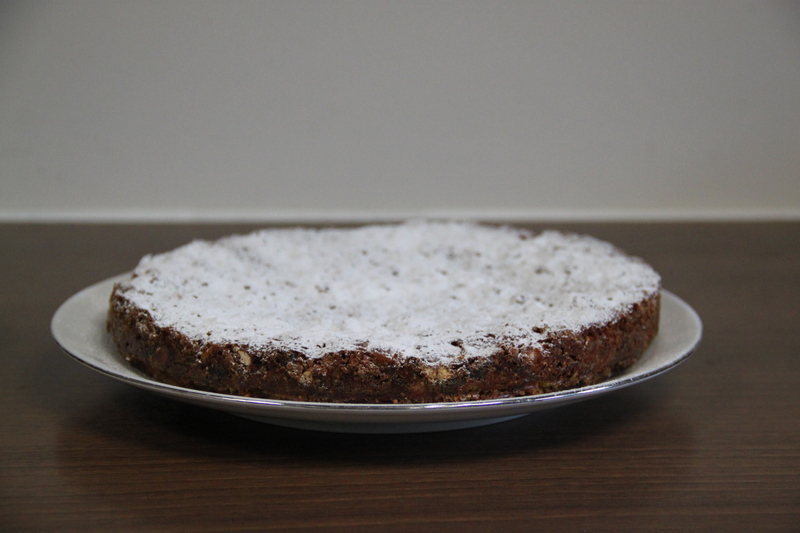 It’s a dense and quite hard cake consisting mainly of fruits and nuts (and sugar) so a small piece is enough. I totally forgot to buy rice paper for my cake but it worked well without. Adapted from Jamie Oliver’s recipe. Cover a 22cm springform with rice paper. Toast the nuts in a dry pan and mix with the mixed peel and flour. Pre-heat the oven to 150C. Mix the figs into a paste using a food processor. Transfer the paste to a saucepan and add 1 tbsp sherry/vin santo, honey, sugar and all the spices and bring to the boil. Simmer for 5-8 minutes and then add it to the nut mixture. Mix well and add another tbsp sherry/vin santo if the mixture is dry. Pour the mixture into the tin and bake for 30 minutes. Carefully press down a layer of rice paper on top of the cake and bake for another 10 minutes. Leave to cool in the tin. Dust with plenty of icing sugar, cut into thin slices and serve.